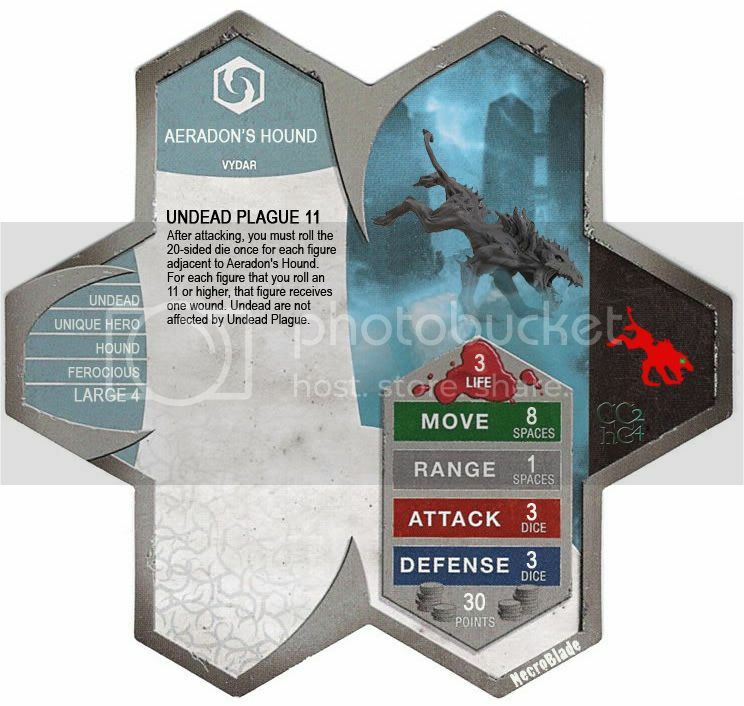 I would like to submit NecroBlade's Aredon's Hound. It is a Mage Knight figure that goes for around 3 dollars. There is also a figure called Blood Hounds that is only around a dollar and is the exact same sculpt. Thanks for the feedback judges. HS already has plague-ridden hounds, plus other units with the "roll a d20, give adjacent figures a wound." Aeradon's Hound doesn't bring much new to the table. I vote NO to review. I know I'm not official, but 30 points for a 3-life fig seems a little broken to me. There are some interesting things going on here, but I agree with Killometer and cmgames, and unlike cmgames, I am a judge. When NB created this custom it was a unique concept and figure. Now, with the passage of time, I have to agree with Killometer, it no longer brings anything unique that several official figures don't already have. Although, for posterity I like Aeradon's Hound, for our purposes here I have to vote NO to review Aeradon's Hound. I like the premise of this Hound, but the same things that have been mentioned make me leery. I do not mind that he's like the Marrden Hounds, because he's a single figure, but if you look at other 3 life figures, they cost over 30 points. If he had only 2 Life, or 2 Defense...maybe. But as is I agree with everyone else when I vote NO for Aredon's Hound. Last edited by ZBeeblebrox; December 6th, 2010 at 12:47 PM. I like this revision and he fills a niche in Aquilla's army that does not have any multi-hit ranged heroes. 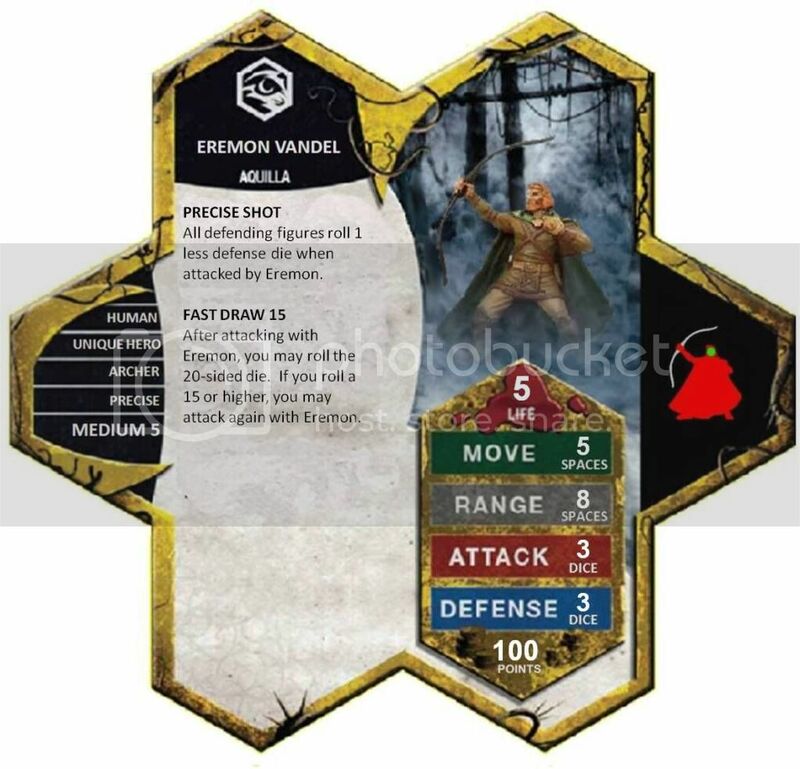 I still have concerns with cost--precise shot can be quite potent and Fast Draw, while d20 dependent, also has devastating potential (with a range of 8, he really has little limit other than the d20). However, I'm willing to give this figure a run with these revisions. I vote YES to review Eremon. I wonder whether 5 life won't still be a bit too much, but it's close enough now that I'm going to vote yes to review Eremon Vandel. Aredon's Hound - I actually like how this guy can be nice filler in a hound army. Have room for one more (but not the squad), no problem, get The Hound. I hadn't factored in the 3-life for the points, but it doesn't look like I have to at this point. In any event... Yes to review. Yes for Eremon. I think I might like Fast Draw to be 16+ instead of 15, but I want to give it a go. Last edited by nyys; December 6th, 2010 at 10:08 PM.